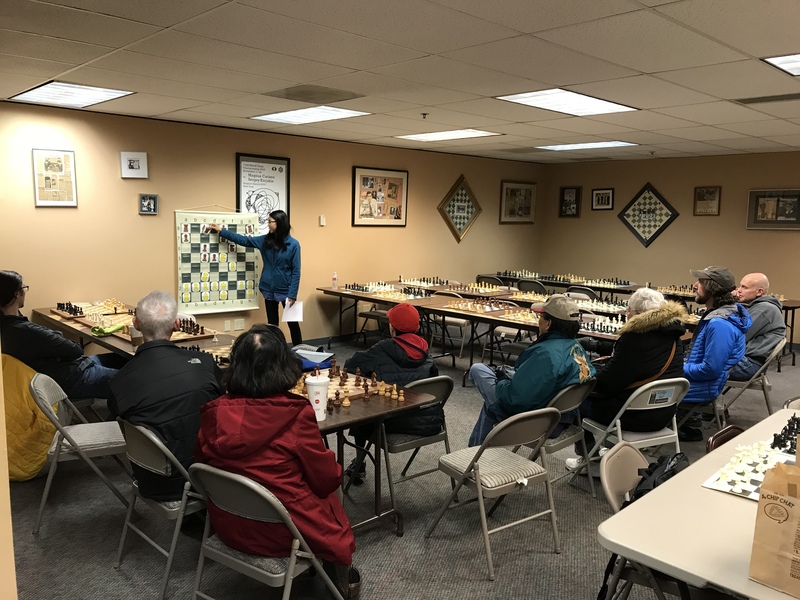 Chess club news (but see “Tournaments” for most completed chess tournament news). 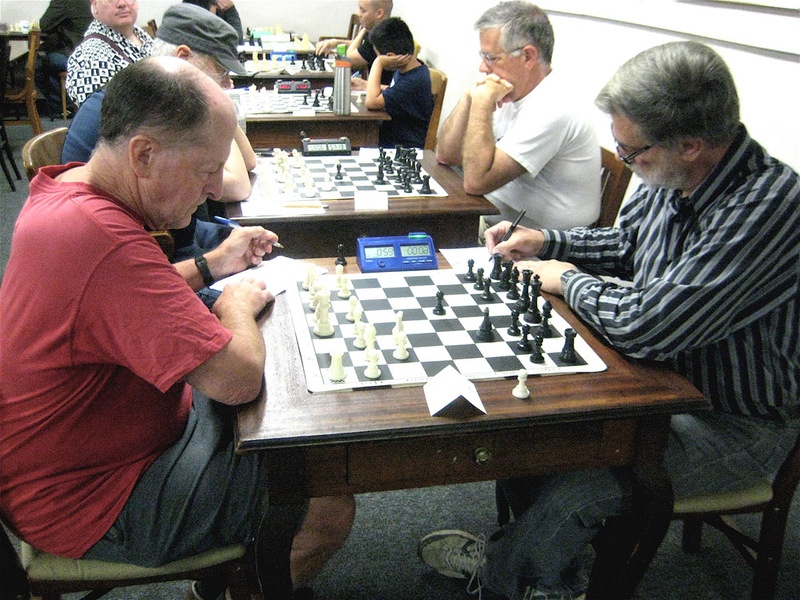 Goffe vs. Murray at the Portland Summer Open. 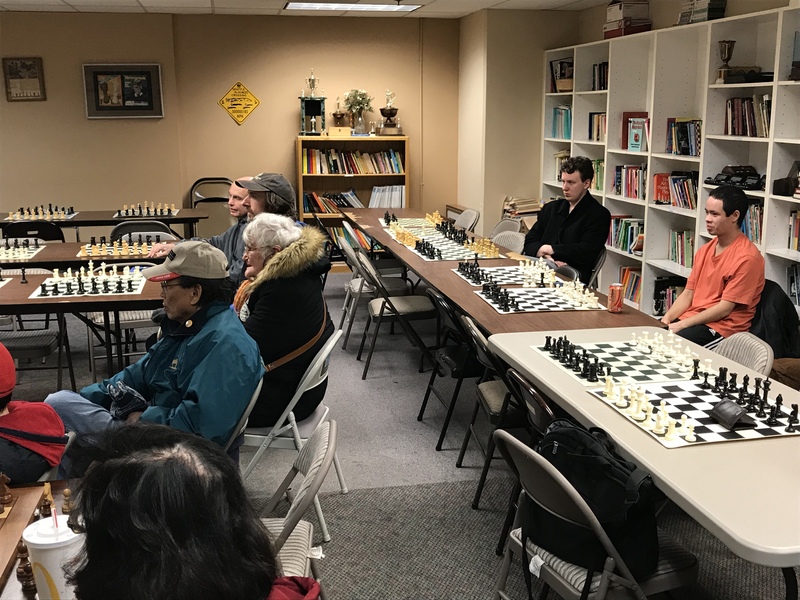 As reported by Brian Berger, “Preregistration numbers for the Portland Chess Club’s Summer Open tournament gave the first hint that a full house could be expected. 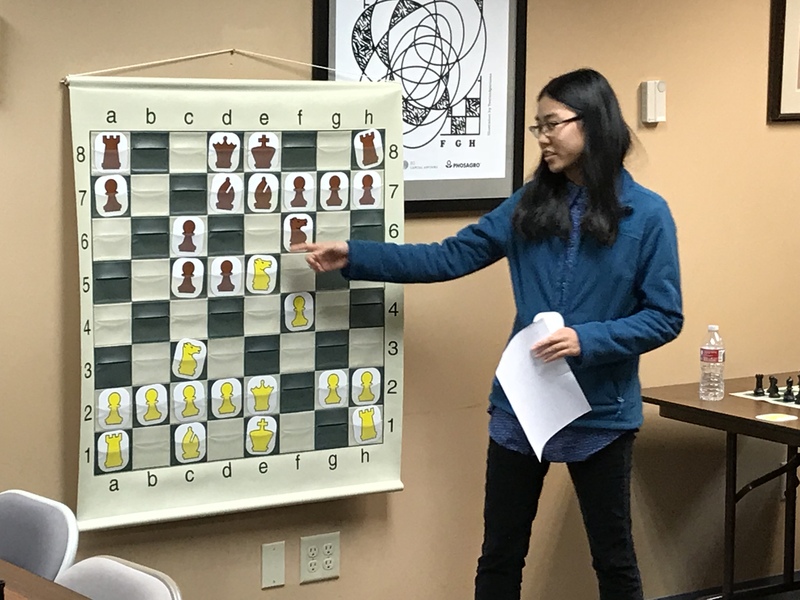 And a full house it was, as 42 players gathered to test their playing skills–many of them new faces to this reporter.” The Open section was won by Seth Talyansky, with an impressive 4.5/5, drawing only Matt Dalthorp. 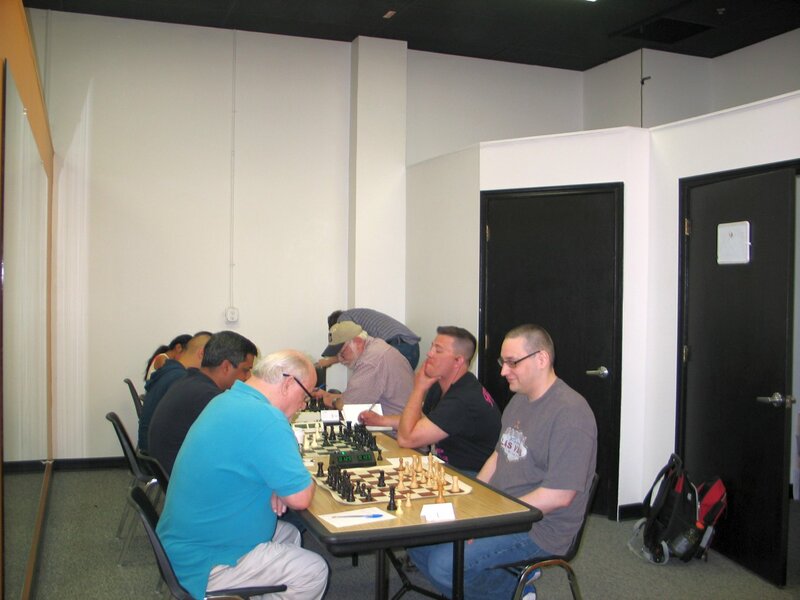 Brian’s full story will appear in the August issue of Northwest Chess. The photo, taken by Brian, shows some of the action, with the game Michael Goffe (L) vs. David Murray in the foreground. Richards vs. Buerer at the Portland CC June G/60. 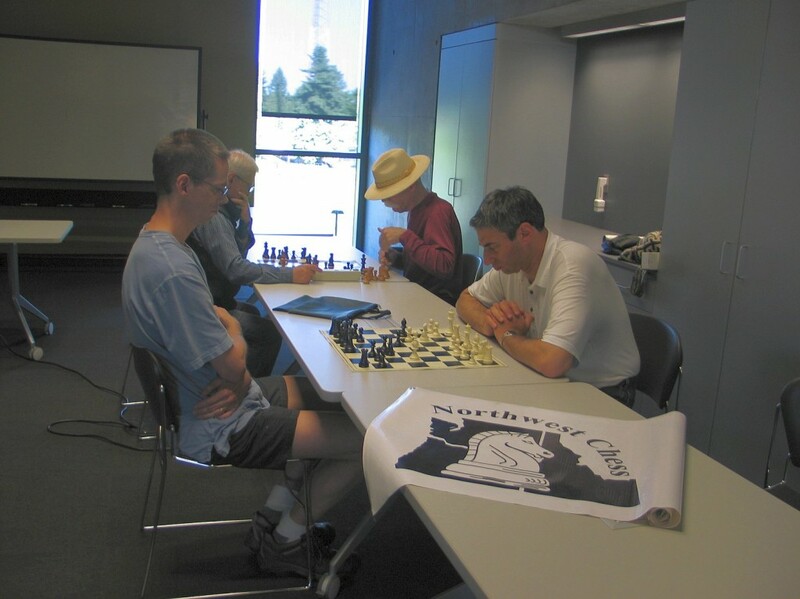 As reported by Brian Berger, “With still a threat of showers looming on the day of the Portland Chess Club’s Game 60, 18 resolute chess aficionados decided to spend their Saturday in over-the-board combat, TD’d by the recently returned world traveler (see the July issue of Northwest Chess) Neil Dale.” The contest was won by Jason Cigan, taking all four games. 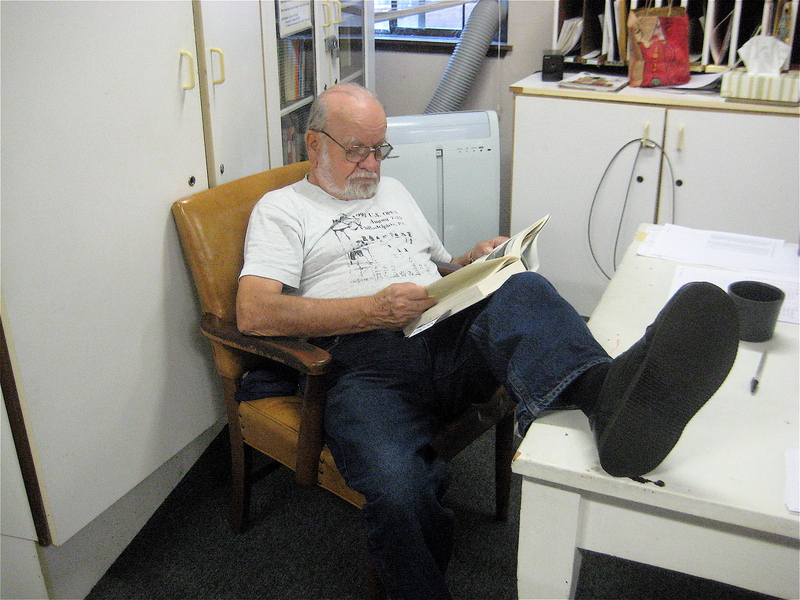 Once again, Brian’s full story will appear in the August issue of Northwest Chess. The photo, taken by Brian, shows some of the action, with the game Jerrold Richards (L) vs. Harry Buerer in the foreground. Vivi Bartron posted this photo on facebook so I assume she took it. This not the Tacoma CC that I remember visiting several years ago. This looks like more space than I remember. Maybe some one can take some more photos. Understand there maybe some new type events held there next Spring. 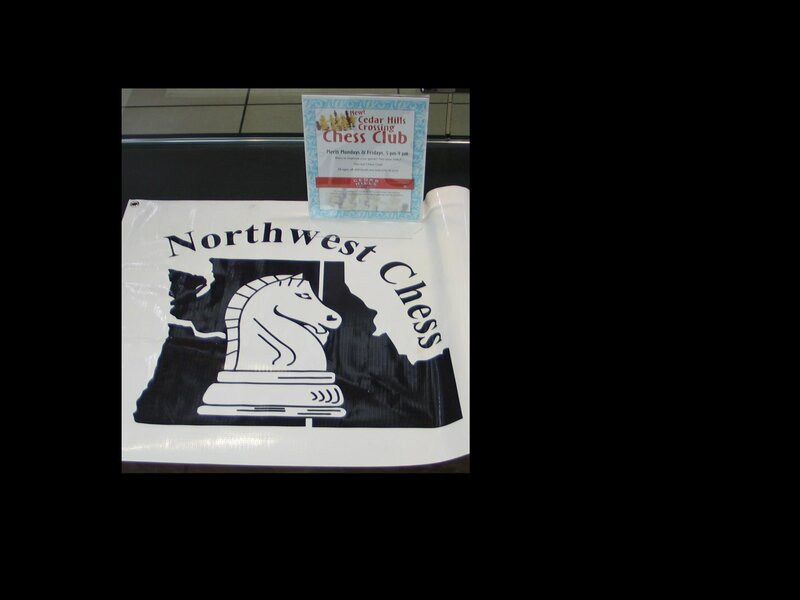 NWC Banner Visits the Vancouver Washington Chess Club on May 20, 2013. The club meets at the Vancouver main library on C and Evergreen in downtown on Mondays 5pm to 7:45pm. There is a kids group that meets 4pm to 5pm the same day. Usually there have been more people attending the club than appear in this photo. The weather was very nice on the Monday I took my camera. Play is just skittles some times with clocks. 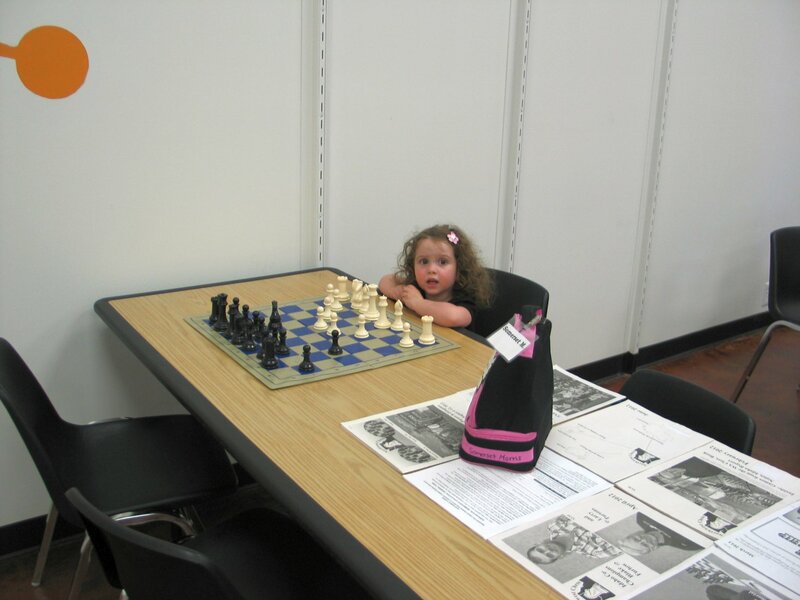 The library has a number of chess sets and boards. 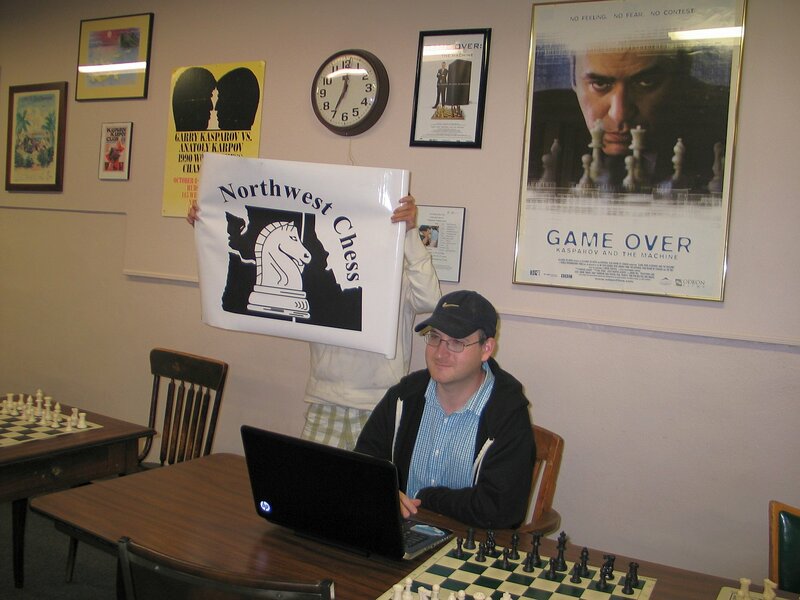 IM Ray Kaufman and the NORTHWEST CHESS banner at Portland Chess Club for May 16 BLITZ event. CLICK HERE for a batch of photos. Nick Raptis won the event with 14.5-1.5. 2nd was Ray Kaufman 12-4 and 3rd Dennis Hoefler with 10-6. Mike Janniro was the TD. Took my camera and the NWC Banner to Beaverton on Friday May 3, 2013. 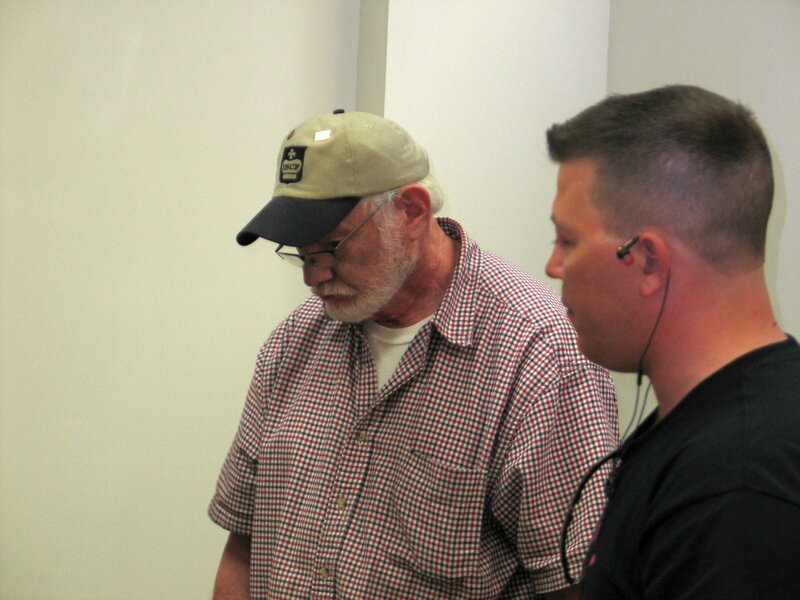 The club organizer Sean Tobin talked the mall management into letting chess be played in a empty store front. 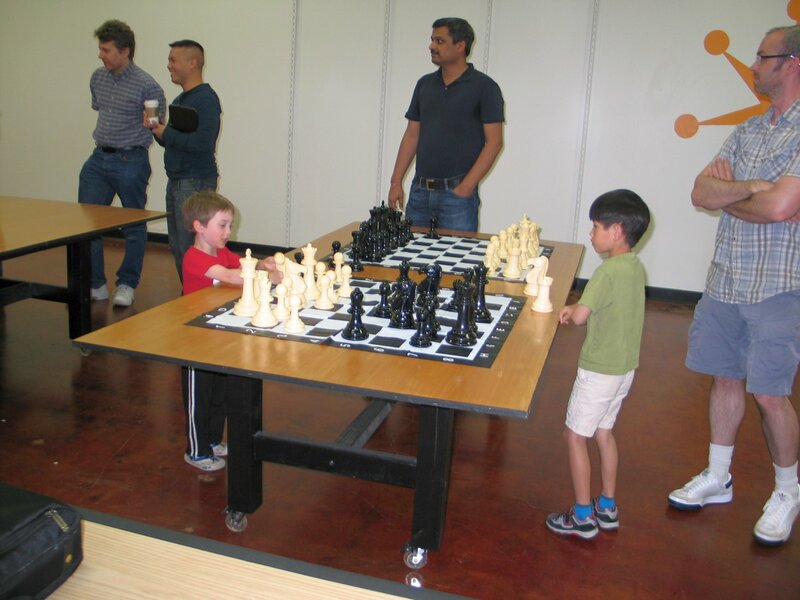 It was the TGIF May chess tournament that I visited. 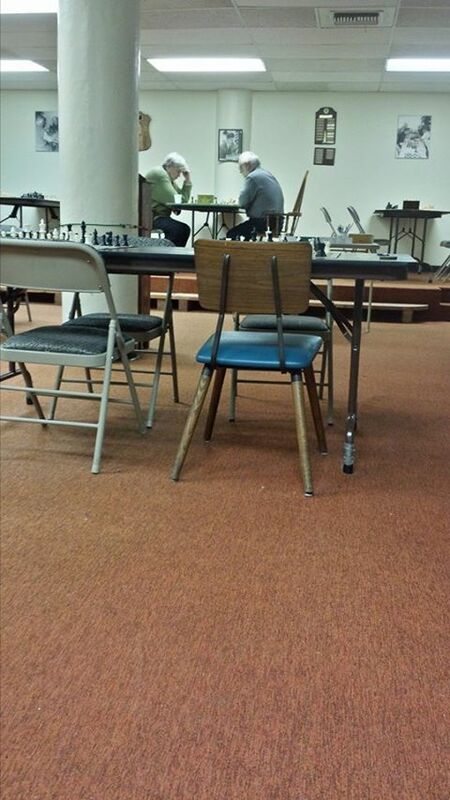 There is some space behind a barrier where the tournament play happens if the turnout is small. Casual play takes place near the front of the store. There were people of all ages when I was there. Some pictures are below. NWC Banner laying in the front window of the store front. Little girl there with her dad. 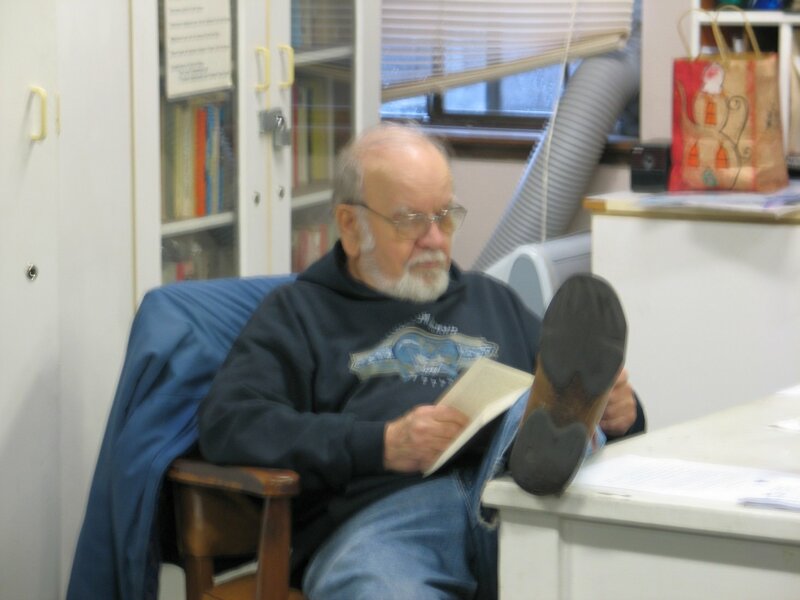 Don’t forget to come to the general membership meeting Friday night Jan. 25th at 8:30 pm. Your input is needed. Results from survey conducted last Oct.
New computer for club to replace one that was stolen last fall. Other items; promoting the club & events, membership blitz, things aimed at the kids. 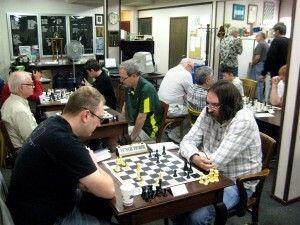 Mike MacGregor is 2012 Tacoma Chess Club Champion. Mike MacGregor successfully defended his title for the 2nd year in a row. He won all 7 rounds of the TCC Championship & he won the Oyster Bay Classic 4-0. He also tied for 1st in the Oregon Open with 4.5.